Water, water everywhere and not a drop to drink. True, Coleridge has a point here, but who cares? At these amazing indoor waterparks, the last thing you'll be thinking about is drinking!Water, water everywhere and not a drop to drink. True, Coleridge has a point here, but who cares? 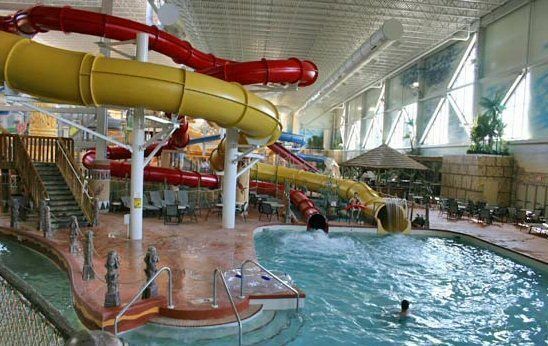 At these amazing indoor waterparks, the last thing you'll be thinking about is drinking! There are thousands of hotel rooms and probably millions of gallons of chlorinated water in the Wisonconsin Dells region of Wisconsin, but we know you'd like to know which ones are our favorites. Here's our list in order of size, cause in this town, size does matter. For more information about Wisconsin's many family attractions, ask the Wisconsin Tourist Office. 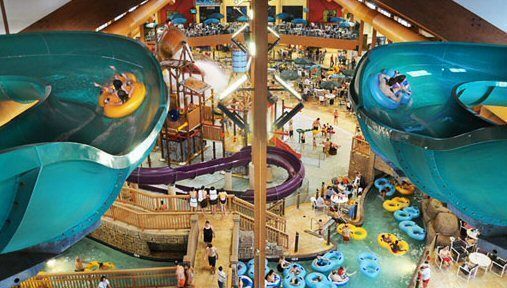 Here you can find the largest indoor water park in the Wisconsin Dells, measuring 250,000 square-feet. The park has four areas: Klondike Kavern, complete with a lazy river ride and over 60 hands-on play/spray features, is geared to older children and adults, the Wild West Waterpark with its own wavepool, raft ride, six-level play structure, multiple slides, and the Wild WaterDome, the greenhouse-like structure offers year round indoor tanning. The newest option, designed with the little ones in mind, is Cubby’s Cove. Lodging options include two and three-bedroom condos overlooking Lake Delton at Wilderness on the Lake, which offers a golf club, the Sundara Spa and a choice of kid-friendly restaurants. This 57,000-square-feet African-themed park is filled with water activities, opened in summer 2000 and built a 58,000-sq.ft. addition, making it (they claim) the largest in the Wisconsin! Kalahari's Master Blaster an uphill waterslide rollercoaster is the only one of its kind available indoors. With the newest attraction, an intense wave machine, the Flow Rider creates 5-foot waves with the pressure of 50,000 gallons of water every minutes, allowing guests to surf or boogie board. The Leopard's Lair offers an interactive play area surrounded by a 3,000 square feet complete with net crawls, water guns, and slides ranging from 6-20 foot in height. For the whole family, the Victorian Falls, a 504-foot long raft ride, wide enough to the family sized rafts and appropriate for all ages. Of their four theme parks, half are indoor including the water park the Bay — a 55,000 square-feet. area complete with 9 towering slides and the Mayan raging river, a not so lazy river with sporadic surprise water sprays. Nearby, the Hispaniola Bay children's activity pool has its very own interactive pirate ship and gentle waterfalls. For a change of temperature, the Bay offers the Jaguar Hot Tub and Sacred Well Whirlpool. Marge and Gary Tillery brought their 7 and 3-year-old sons, Grant and Jeffrey, to Mt. Olympus a few years ago. "I couldn't believe that we actually spent two whole days in the water," said Marge. "I loved it, especially how fast I went on the slides," added Grant. Marge liked the fact that the pirate-themed area for toddlers was close to the water slides that her older son was enamored with. Some of Grant's other favorites were playing water basketball, and trying to walk on floating lily pads in the warriors water walk, which is a type of water obstacle course. The entire Lost Rios waterpark can be seen from a bird's eye view on its Flyan Mayan Coaster Zip slide the world's longest and fastest indoor water coaster (they claim). The Mount Montezuma's Myan Temple activity center has plenty of interactive water toys and slides for kids to play with as they get soaked from the giant bucket that holds 500 gallons of bucket dumps over the center. The Madador Mat Racer allows siblings or friends to compete to see who is quicker on the mat track. Among the park's several slides, the hot tub and lazy river offer some relaxation and a break from the park's other fast paced attractions. This resort has a newly expanded Water Factory suitable for preschoolers, with a shallow water play area for those under 80 lbs., a baby swing and the Aloha Pavilion with a traditional pool with a few petite waterslides. For the more adventurous, the Polynesian's Temple of the Black Pearl is the first hotel water park ride that takes place in the dark. Even business travelers must enjoy these indoor water parks, as the region's new conference centers have joined in the fun. The RainTree Resort & Conference Center's (888/253-4386) Amazon Falls boasts a rain forest theme with more than 50 interactive water games set among ruinous temples, waterfalls, and waterslides. Even better, you can check that briefcase at Blizzard Bay, the snow and igloo-themed park with more than 30 water activities, including a castle and floating foam ice, at Wintergreen. Next time, bring the kids! Money-Saving Tip: Budget watchers may want to check out a smaller hotel in the area. The Copa Cabana Resort Hotel & Suites (608/253-1511), Grand Marquis (800/447-2636), the Meadowbrook Resort (877/993-3557) and the Alakai Hotel & Suites (800/593-9392) also have their share of slides, bubbling geysers and water-sprouting palm trees. Wow! It's a very beautiful place. I'm sure kids will enjoy spending their time in that kind of place. It's a nice place for a family outing. I love it. 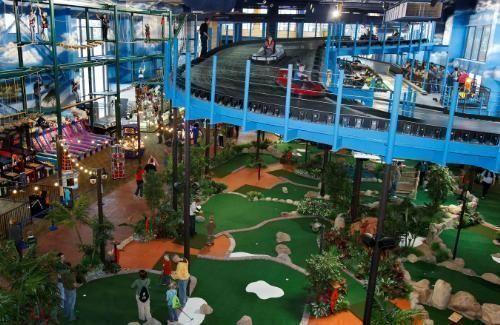 There are so many other things to do in the Wisconsin Dells as well! You can have a visit with nature and I strongly suggest checking out Devil's Lake and Mirror Lake, the local state parks. Going for a tour on the Wisconsin Ducks is an memorable experience too!